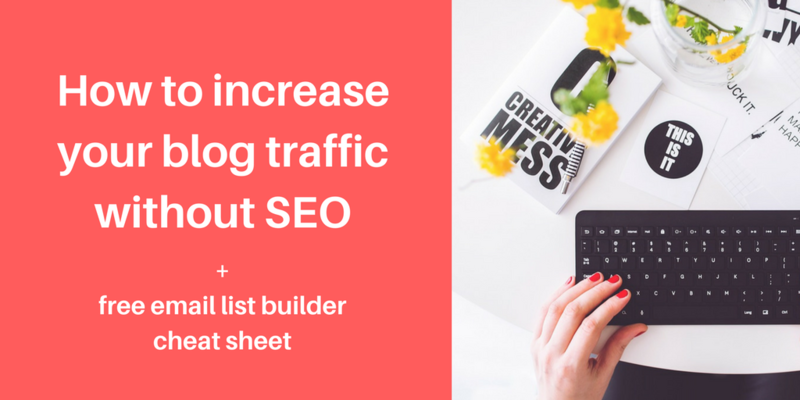 If you own a blog, you’ve probably had a lot of people tell you that you need to work on your SEO so that you can get traffic from search engines. Search engine traffic is definitely important. After all, it allows you to attract people to your posts long after you publish them. But you shouldn’t focus solely on Google and other search engine rankings to promote your blog. Why? You’ll be in trouble if that traffic suddenly disappears. Ready to diversify how you attract people to your blog? Check out these 7 tips on how to increase blog traffic without Google search rankings. Having a hard time getting new subscribers for your email list? Learn our 4-step formula for building your email list like a pro. Download the free email list builder cheat sheet. You might already be on social media. But are you using it in the best way possible to promote your blog? Increase blog traffic without Google rankings by sharing each of your blog posts on social media after you publish them. Some of your regular followers might get to know your publishing schedule and visit your blog on their own to read new content. But many people won’t. When you promote your posts on social media, you’re reminding people to check them out by heading over to your blog. To boost the number of people who click on links to your blog on social media, use engaging headlines, include good eye candy, and create social media posts that leave people wanting more. Instead of telling them everything they’ll find in the full blog post, ask a question or share a snippet to make them feel compelled to visit your blog. One of the best ways to increase blog traffic without Google is to get cracking on building your email list. If you ask established, well-known bloggers what they regret the most about their early blogging days, there’s a common answer you’ll get: they wish they had started building their email list much earlier. And second, you own your email list. You may have well-established followings on Twitter or Instagram, but you don’t own these platforms. They could shut down tomorrow or drastically limit your ability to reach your followers and you wouldn’t be able to do anything about it. You don’t have to worry about this with an email list. Reach out to each blog author and pitch an idea for a guest post. Be sure to follow any guidelines provided about guest posting. Some people shy away from guest blogging because reaching out to other bloggers takes a lot of time. If this sounds like you, don’t give up yet. Another way to increase blog traffic without Google by publishing on other platforms is to do a content swap. What’s a content swap? It’s when you and another blogger agree to write and publish a guest post on each other’s blogs. Set one up by creating a “write for us” page on your blog that outlines the types of blogs you’d be interested in swapping posts with. When you receive a request, communicate with your potential collaborator. If all looks good, create an awesome post to swap. You can get the word out about your content swap by sharing your content swap page on social media, with your email list, and in your email signature. If you don’t have time to write guest blog posts or do a content swap, there’s still a way to increase blog traffic without Google by engaging with other people: you can comment on other blogs. Use your personal name and photo in your commenting profile. This way, people will be more likely to see you as a person instead of as a brand that just wants to boost its bottom line. If you’re like a lot of people, “networking” may be a word that makes you feel icky: you may think of it as something that only sleazy, slimy salespeople do to find their next prey customer. But networking doesn’t have to be this way, and it’s a great way to increase blog traffic without Google. Build relationships with influencers in your industry using sites like BuzzSumo, Inbound, BizSugar, and Facebook groups. Identify people you think would be a good fit and start building a relationship with them by following them on social media and engaging with their content. Then reach out to them to see if they’d be open to letting you interview them for your blog or helping you promote your content. Connecting with influencers is a great way to get to know experts in the field and increase blog traffic without Google rankings. If the thought of trying a new blog promotion strategy seems daunting, this tip is for you. A simple way to increase blog traffic without Google is to take a look at where your blog traffic currently comes from. Use analytics to identify the strategies you’re already using that are working the best for you. Then figure out if you can put more time or resources into them. Can’t carve out more time in your schedule to work on these high-performing strategies? No problem. Let go of strategies that aren’t working so well and reallocate your time to the more promising ones. Google and SEO are important for driving traffic to your blog posts. But they aren’t the be-all and end-all of building an epic following. Use the tips outlined above to increase blog traffic without Google search rankings. Just like you don’t want to depend on just one type of investment to grow your wealth, don’t depend on just one online source for building your tribe online. ← Diffuse vs. defuse: What’s the difference?